Nick Swan with a nice jew off the rocks at Yaroomba. 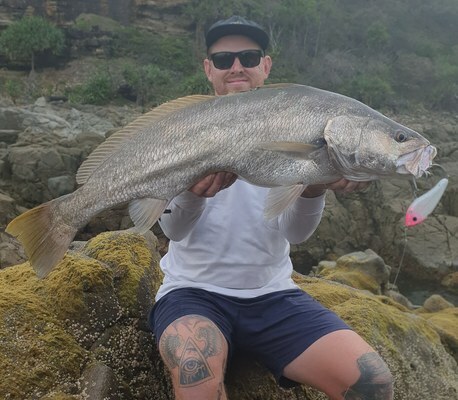 With the end of March now upon us this past week North reef has been providing anglers with some big jewfish, pearl perch, longtail tuna and various cod species. Most fishing this time of year is done with a heavier paternoster rigs fished hard on the bottom with mullet, squid and pilchard baits. Closer in Sunshine Reef has been holding great coral trout and standout sweetlip. These fish are best targeted with live bait/slab bait and a snelled or gang hook rig with a running 8-10 ball sinker. Spanish mackerel and even the odd spotty mackerel are about so pilchard floaters are a must if on anchor. The Spanish are huge at the moment so using single strand wire is recommended as well as super small swivels. In the surf the gutters are providing light surf anglers with small dart and bream with the occasional bigger fish coming from the points of Arkwright and Noosa Headlands. As usual fishing with light running sinker rigs and light lines for the small fish and heavier gang hook setups for the bigger fish. In the Noosa River we have had a change in conditions with the recent rains. This will result in a flush of prawns which the vast majority of bigger fish love. With this is mind, now is the time to try and match the hatch with soft plastic prawn profile baits with night time a great time to target the big flathead, jacks and bigeye trevally. Be sure to carry a big landing net when land based and a decent pair of pliers. Areas to concentrate your efforts include the river mouth, Dog Beach, Munna Bridge and Noosa Marina. For those fishing baits during the daytimes, the turn of the incoming tide is a great time to fish as the cleaner water helps clear up the dirty water produced by the recent rains. Lures Fishos who have been chasing the elusive red-dog have been doing their best by throwing 80-100mm hard body lures and bigger paddle tail soft plastics. Lastly with the recent rains the crabs are very much on the move and now is the time to get your pots out. The freshwater areas of Lake Mac and Borumba dam certainly got a good drenching with Lake Mac Donald now overflowing and Borumba almost at full capacity. Fish in both areas will be feeding on various prey items getting washed off the trees and surrounding hill sides. With this in mind now is a great time to break out your creature baits and work the edges for the bigger fish lurking in the shallows. As the sun rises move into deeper waters and drop offs and throw spinnerbaits and blades and try various retrieves until you crack the code. So on behalf of Jack Mangrove, best of luck on your fishing adventures!